Happy New Year everyone!..As we ring in the New Year, I love to spend time with my family to celebrate the beginning of a great year to come. 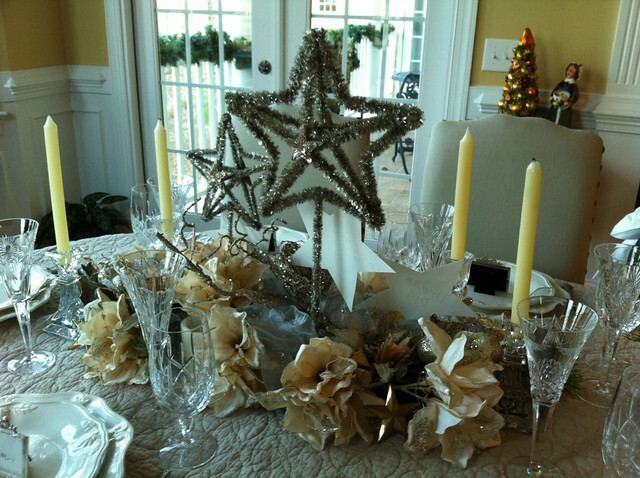 Also, it is my time to sit and enjoy all the “labors of love” of my Christmas decorating. 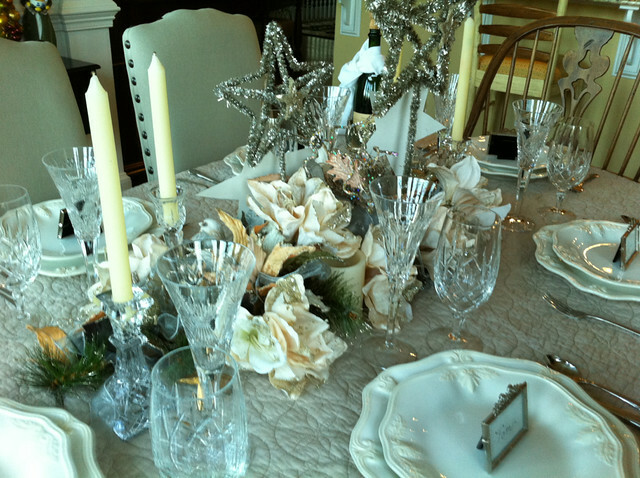 I love my Christmas tablescape, however, that is the first thing that is “broken down” so I can set my table for our New Year’s family dinner. 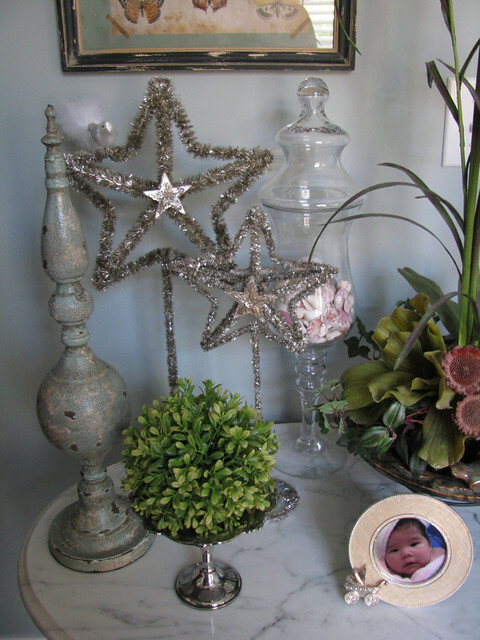 Rather than the usual candlesticks and flowers, this year I took a swag from one of the light fixtures, flowers and bird’s nest from a tablescape in my bedroom, and stars that were on the bathroom countertop. 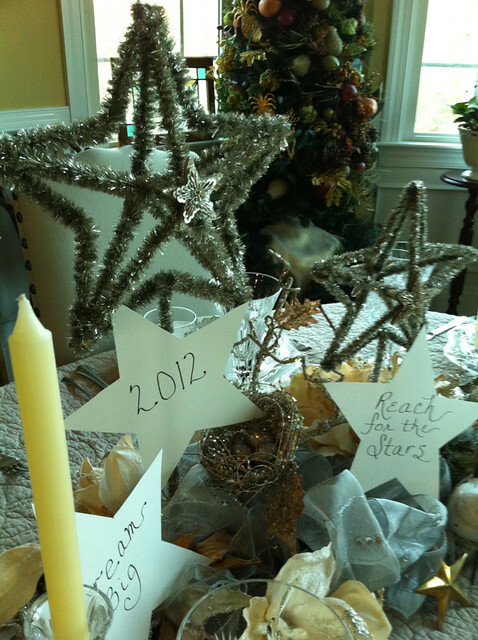 So I repurposed my existing decorations to create my New Year’s tablescape. Hope you enjoy! 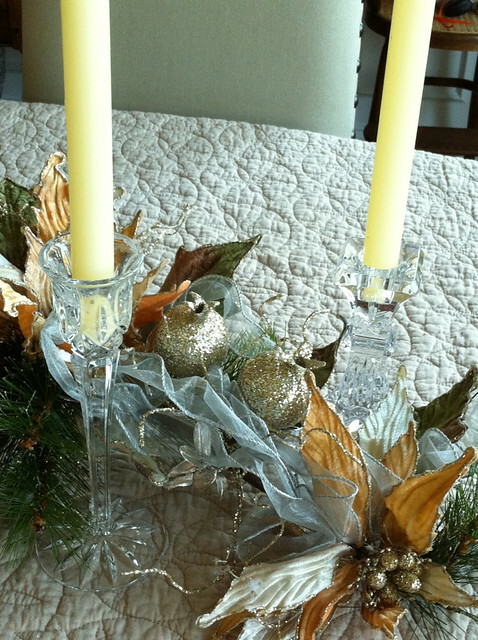 The “centerpiece”. 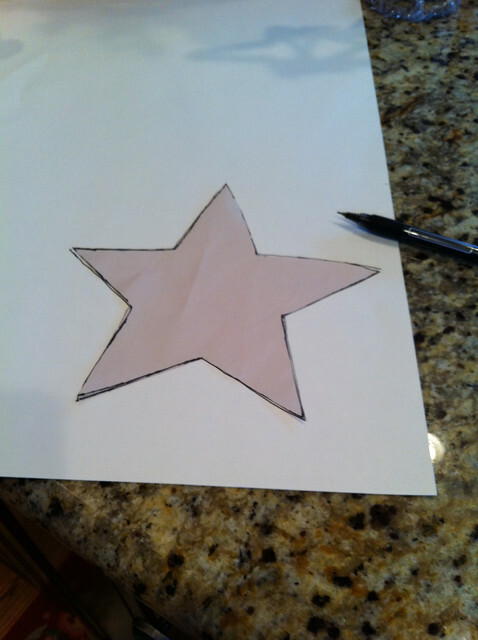 I used the stars as my inspiration. 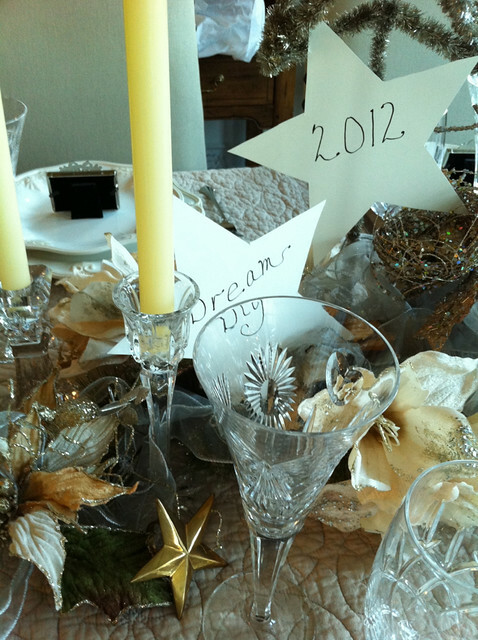 The following pics will show you how I created my tablescape. 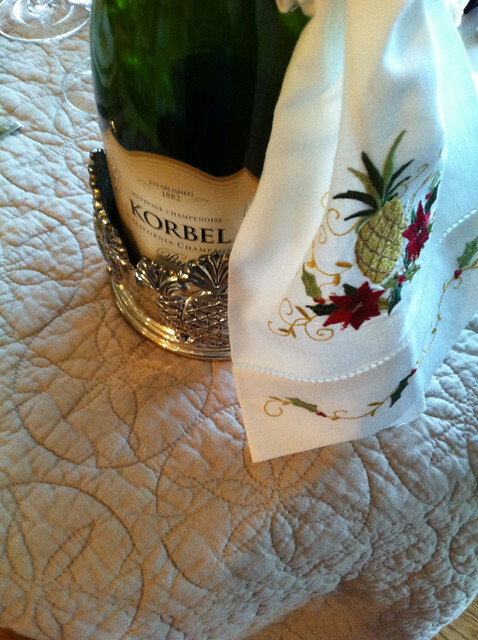 I began with using a matelasse coverlet that I actually use as a tablecloth. 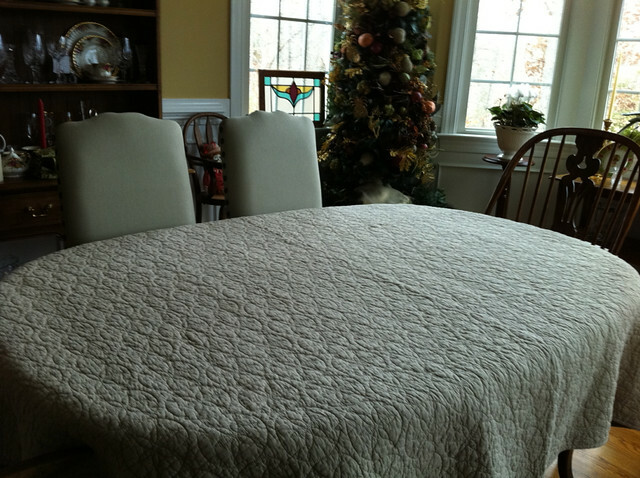 I have used many of these coverlets and quilts in the past in lieu of traditional tablecloths. 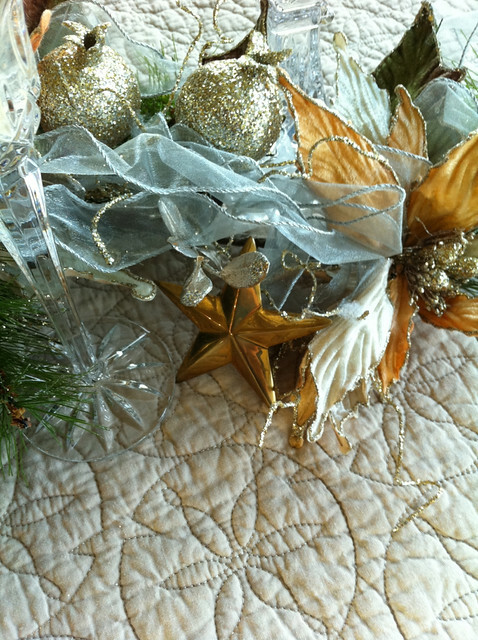 This coverlet has a star pattern on it, so it worked well with my theme. A twin size works well with my table when I do not have a leaf in it. The star pattern in the matelasse. 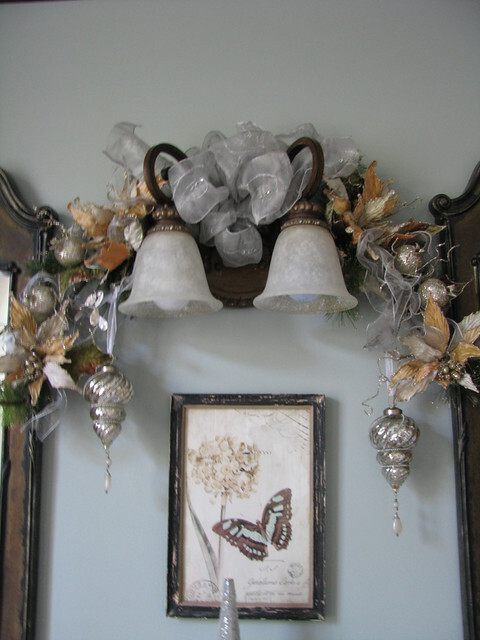 I used a swag as my base, that I made that went over a light fixture in the master bath. Used these flowers and bird’s nest stem.. 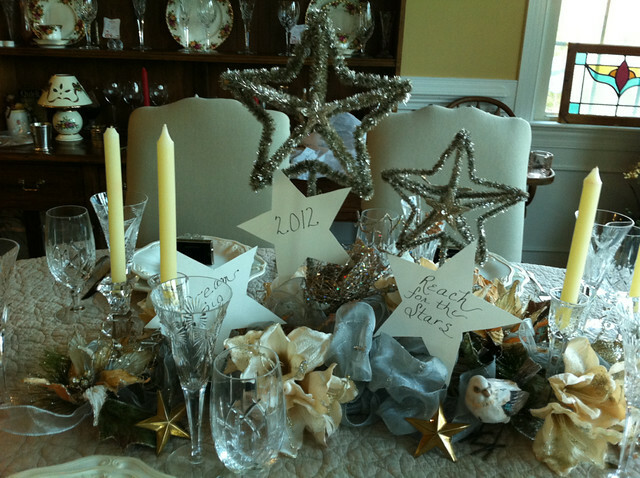 These are the stars that were the inspiration of my tablescape. I added the flowers to the existing swag..
Another view of the flowers along with my Waterford candlestick that I got from Costco 🙂 for a deal! And what’s a New Year’s dinner without the bubbly? 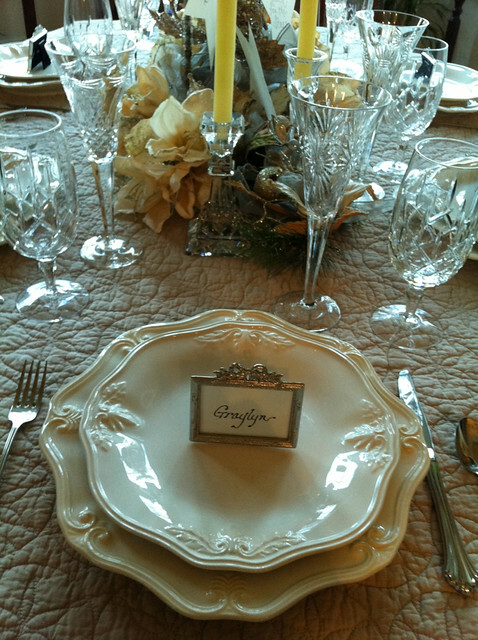 My dinnerware are Lenox Butler’s Pantry. 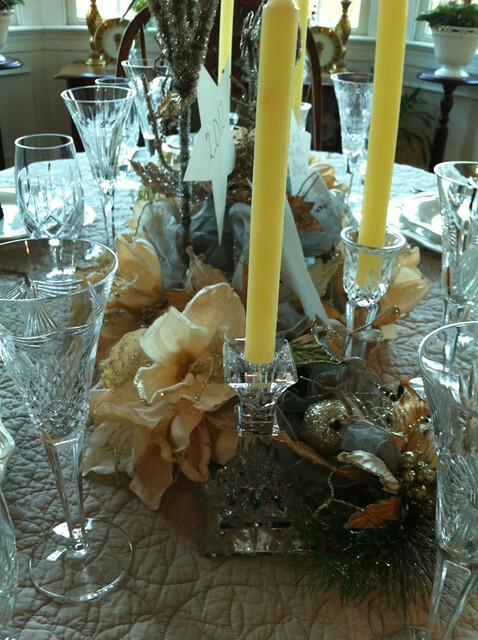 Stemware is Gorham and Champagne flutes are Waterford. 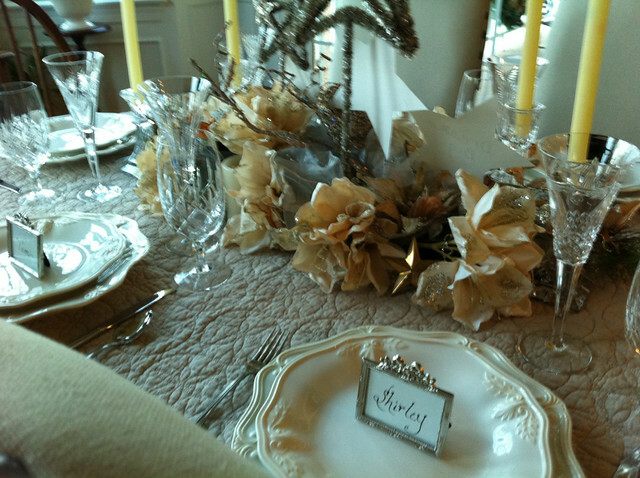 I bought the place card frames from Bombay many years ago..Loved that store…especially the outlet they had in Atlanta/Roswell. So as the sun is setting and waiting for my family to arrive, I reflect on the good things to come in 2012 and the blessings I had in 2011. I wish for everyone, “enough”. I know that is has been a very popular statement, “Enough”..But it is so true. I wish you and yours Enough Good Fortune, Enough Good Health, Enough Happiness, and may your dreams be realized beyond your expectations..
Looks beautiful and festive. It’s always a “good thing” to be able to repurpose existing items, too. 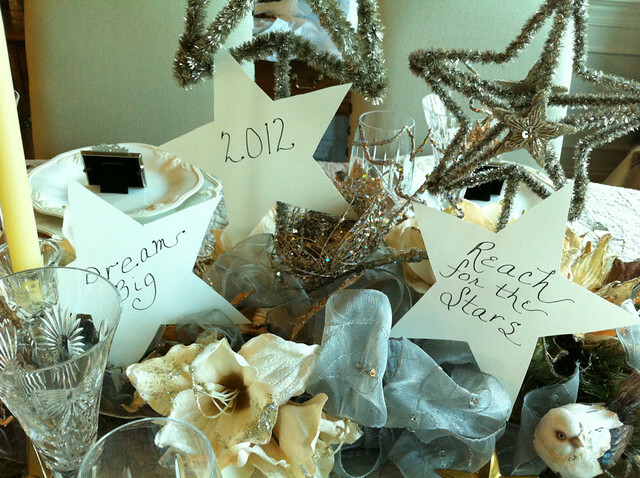 Love the messages of inspiration for 2012. Happy New Year! Wow, creativity is overflowing in that beautiful mind of yours. I love the namecards and calligraphy and, of course, each and every picture. Happy New Year, Shirley. And Happy Birthday on the 4th. Thanks for sharing your ideas. Butler’s Pantry aaaah I adore it! The ease of it! 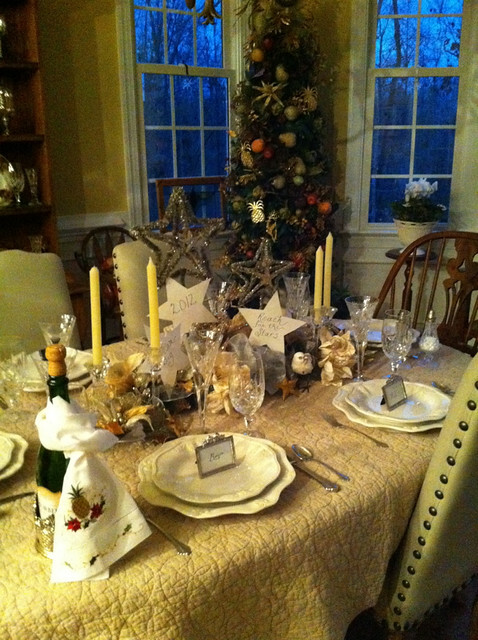 The table is :*~:*Beautiful:*~:*~ Thanks for sharing! 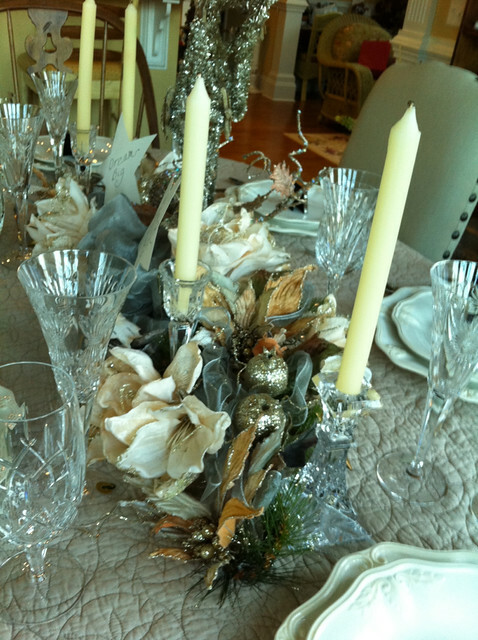 Adore you table, Butler’s Pantry is one of my favorites! It is soooo versatile and easy and “creamy”. It’s just :*~:*~Beautiful:*~:*~ Thanks for letting me “peek”! Beautiful! I love the stars. Very nice. The decor looks amazing! Happy New Year! 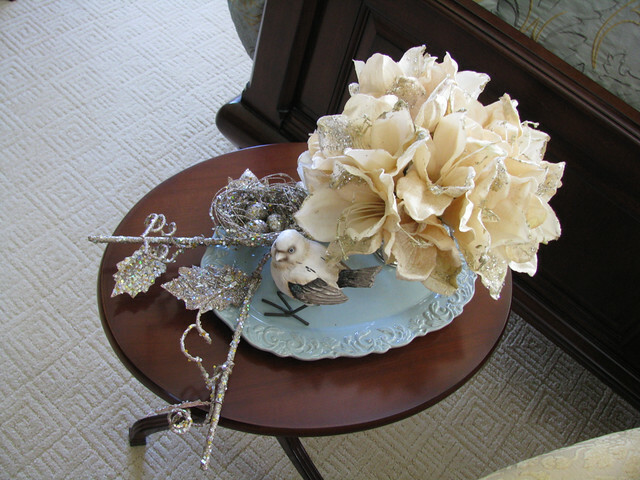 I really adore every piece of treasure you have on your table. Amazing beautiful and your so good putting your set. I love all the colors you have and how they coordinate. Thanks for the inspiration. 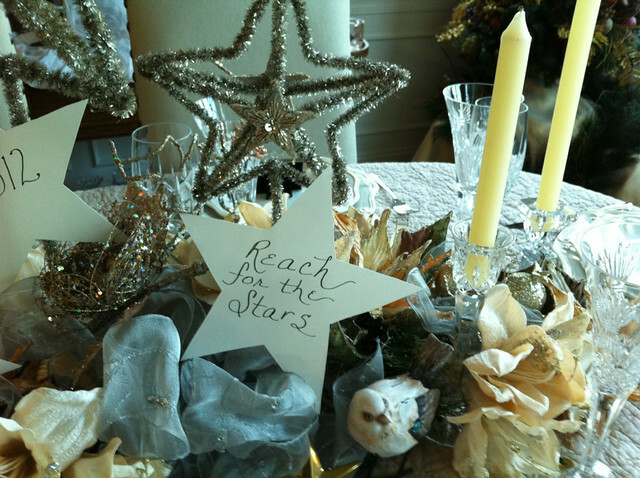 If you ever want to look for more items for different party themes check out our Social Couture website.